The Japanese symbol representing Kaizen. There is a concept that we follow at Bomber Wrestling known as the Japanese Kaizen. 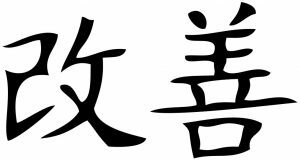 The Japanese word kaizen simply means “change for better”, with no inherent meaning of either “continuous” or “philosophy” in Japanese dictionaries or in everyday use. The word refers to any improvement, one-time or continuous, large or small, in the same sense as the English word “improvement”. Beyond the definition however, there is a deeper meaning to the word. Kaizen represents a responsibility to ourselves and to our community to always improve, always seek to better ones self and by doing so create a better world. No matter how large, no matter how small, every step we take is a step forward. Please use our always growing library to explore your own sense of Kaizen. Learn, grow, be your best self so that you are in a position to help others do so as well.